Forget About the Wrong Things People Do to You. Don’t Try to Get Even. Never get revenge. Never hold a grudge against any of your people. Instead, love your neighbor as you love yourself. Oh, Boy! Is this a hard one to do. Don't we love to jump in and "pay-back" - "give them a piece of their own medicine" we say..
"Never pay back evil with more evil. Do things in such a way that everyone can see you are honorable. When we study revenge, and how to get back - we do more damage to ourselves, than anything our enemy has, or could inflict upon us. OK, How do we deal with this problem? 5 As King David came to Bahurim, a man came out of the village cursing them. It was Shimei son of Gera, from the same clan as Saul’s family. 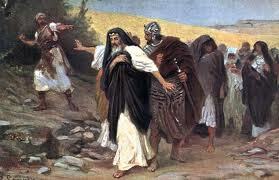 6 He threw stones at the king and the king’s officers and all the mighty warriors who surrounded him. 7 “Get out of here, you murderer, you scoundrel!” he shouted at David. 11 Then David said to Abishai and to all his servants, “My own son is trying to kill me. Doesn’t this relative of Saul have even more reason to do so? Leave him alone and let him curse, for the Lord has told him to do it. 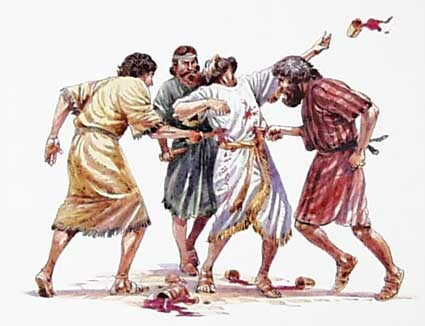 David's men around him suggested that they cut off this guy's head..
" Shimei son of Gera, the man from Bahurim in Benjamin, hurried across with the men of Judah to welcome King David. 17 A thousand other men from the tribe of Benjamin were with him, including Ziba, the chief servant of the house of Saul, and Ziba’s fifteen sons and twenty servants. They rushed down to the Jordan to meet the king. 18 They crossed the shallows of the Jordan to bring the king’s household across the river, helping him in every way they could. 44 The king also said to Shimei, “You certainly remember all the wicked things you did to my father, David. May the Lord now bring that evil on your own head. 45 But may I, King Solomon, receive the Lord’s blessings, and may one of David’s descendants always sit on this throne in the presence of the Lord.” 46 Then, at the king’s command, Benaiah son of Jehoiada took Shimei outside and killed him. There is a difference of us refusing to revenge anyone, and GOD's judgment. "But if you do what is wrong, you will be paid back for the wrong you have done. For God has no favorites." Have you called or emailed someone to invite them to join us in our daily study in Proverbs? It would be great if you did that today! Thanks.